Figure 12-4. - Enlisted Surface Warfare Specialist Insignia and Enlisted Air Warfare Specialist Insignia. 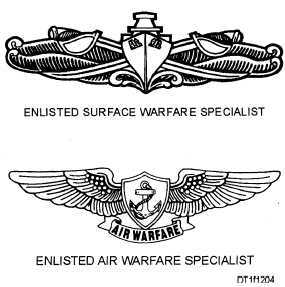 squadron duty have an opportunity to qualify as an Enlisted Surface Warfare Specialist (ESWS) and/or Enlisted Air Warfare Specialist (EAWS) (fig. 12-4). This will depend on what type of platform to which they are permanently assigned. Contact the command master chief who serves as the ESWSIEAWS coordinator for Personnel Qualification Standards (PQS) for your ship or unit. 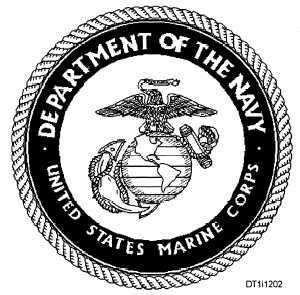 The Fleet Marine Force (FMF) is a balanced force of combined ground and air arms primarily organized, equipped, and trained for offensive amphibious or expeditionary employment Marine Forces Atlantic (MARFORLANT) and Marine Forces Pacific (MARFORPAC) are an integral part of the U.S. Atlantic and Pacific Fleets. These forces are subject to the operational control of fleet commanders, while the Commandant of the Marine Corps (CMC) retains administrative and training control. The mission of the FMF dental organization is to ensure the combat effectiveness of the FMF by providing a comprehensive program of dental support. During contingency or mass casualty situations, FMF dental personnel augment the medical effort under the direction of the cognizant medical authority. The Marine Corps has dental officers and Dental Technicians assigned to the following levels of organization. The same dental officer may frequently be assigned to more than one level. U.S MARINE CORPS The Director of Dental Programs (DDP) also has the title of Dental Officer, U.S. Marine Corps, and is the staff dental officer to the Commandant of the Marine Corps. Assigned to the Health Services Directorate, the DDP reports to the Director of Health Services. The DDP provides assistance and advice to the Director of Health Services on both professional and personnel matters relating to dental support throughout the Marine Corps. The DDP is supported by an administrative assistant who is a Master Chief Dental Technician.